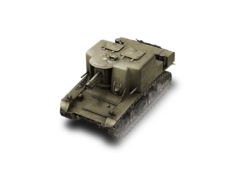 The T18 is a fully enclosed tank destroyer with thick frontal armour that makes it difficult to penetrate for same-tiered enemies. The T18 is also quite mobile and has excellent close-range firepower for its tier once armed with the 75mm howitzer. It functions reasonably well as a front line force due to the frontal armour and a powerful gun. Please note that if one shoots the T18's gun directly, one has a decent chance of damaging the tank rather than having a ricochet. Circle strafing will more than often not work on this tank unless it is attacked from behind, due to its some-what wide gun arc and decent track traverse. Just remember that you have poor view range and poor radio range. The T18 can be either the best tier 2 TD or the worst, all depending on how you use it. As a stock tank, it leaves much to be desired, with weak suspension, engine, and gun. For the early stages of game play, sniping with this tank can be the best way to go. Its small size allows it to hide well from afar, and its heavier than usual armor allow for many deflections at medium to long range, or even at close range against low-penetration guns. Close-quarters fighting, however, must be done with caution, and preferably with the tank fully upgraded. Even with the top engine and suspension, this TD is very sluggish when compared with other tanks of its class. In the way of armament, however, nothing can defeat it. Armed with a 75mm howitzer, the T18 can destroy any tier 2 tank in two hits, give tier 3 tanks serious problems. Also, the Mk. IX 2-pdr gun is deadly when used at any range and can be very effective when a good player uses its high penetration and accuracy to their advantage. When using the tank in close quarters, it is imperative to always have supporting tanks, as the T18 has VERY light side and rear armor, and since it lacks a turret, it can be surrounded very easily. Although the frontal armor is quite thick, just a few penetrating shots will take this tank out, and caution should always be used. The SCR 200 radio carries over from the T1 Cunningham and should be equipped immediately. Research the suspension upgrade first. Next focus on getting the 75 mm Howitzer M1A1. After that go for the Continental R-975-C1 engine. Optionally unlock the QF 2 pdr. gun if you want to try something that is much more accurate and fires faster. 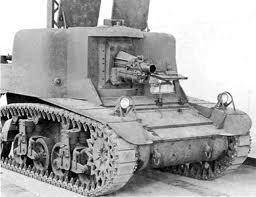 The T18 was originally designed as a self-propelled gun for supporting infantry. It was armed with a 75-mm Howitzer installed in a spacious, fully enclosed armored hull. The development was started in October 1941 and finished in May 1942. The project was abandoned due to the emergence of the more advanced M8. This page was last modified on 4 July 2016, at 09:49.